You may know this by now, but Clos Roche Blanche will close its doors this year, as Didier Barrouillet and Catherine Roussel are retiring to enjoy a well-deserved free time. They had been thinking about the issue for several years and they decided that 2014 would be their last vintage. They're still managing the vineyard this year but the fruit that will be picked next september will not be theirs, as Julien Pineau and Laurent Saillard are buying up the whole vineyard of the domaine, to of course continue making wine from it with a similar winemaking philosophy and organic farming. You can see here a story featuring Julien and Laurent together, although it's about lacto-fermentation instead of vinification, for a change. Julien Pineau was a couple years ago working at the Terres Promises in Provence (Excellent artisan domaine in the backcountry of the Var département). I happened to visit the domain a couple of weeks ago, there was almost a festive atmosphere, like, something is happening with a new, totally open perspective around the corner, without the urge to be around the vineyard every day. The rumor has been around for a while in the wine spheres of course and wine lovers abroad in particular were dismayed that their favorite and long-time artisan wine wouldn't be around any more, or at least that some wine would be made from the same vineyard but not by the same people. The weather was so nice, spring like you love it, warm but not too much, a gentle breeze, everything, so we went for a walk with Catherine through the ritual and initiatic dirt path across the woods to the plateau and its parcels. All these vines, old or younger will not be worked by Catherine and Didier beginning next september, even the ones Noella Morantin has been renting for several years will be purchased by Julien and Laurent, Noella regrouping with the other vineyards of her own. Catherine says that even after all these years she loves this season, with the buds popping up on the vines. We first walk along a parcel worked currently by Noella Morantin. Asked if in 2014 there were problems with the Suzukii drosophilia she says yes, more on the red varieties, and also with the cherry trees, something that matters for Catherine as she tends a vegetable garden and fruit trees. The first alert with the Suzukii was on the cherries in june, long before the grapes themselves were ripe, and later these insects affected also the parcels. I ask if somehow the cherry trees were "responsible" for the spike and multiplication of the drosophilia but she says not as far as she knows, it is rather the weather conditions, she credits the relatively-warm winter of 2013-2014 for the sudden surge in the Suzukii population in 2014. The insect was present before but not in those numbers. In the region the strawberry fields and farms were also harshly affected by the problem. We pass a parcel of old Côt that should be uprooted and then later replanted, these are not the oldest vines of Côt, they are 70 or 80 years old. The grass is to be cut or the soil plowed on several parcels, and Didier will sow another grass strip with wild flowers and weeds to reinforce diversity including with insects. While really happy when she walks through her land and vineyard, Catherine is nonetheless happy to stop soon and begin enjoy some free time, especially during these magic months between april and june. She hasn't the travel bug and has no plans to visit the other side of the world but just having time to go away a week to visit friends in another region is very exciting for her. She says that people often think hazrvest as being the busy season for winegrowers but actuallt for all growers and farmers, it's particularly busy and binding between say, april and june because the foliage grows and you have to keep that in check, watch and anticipate the weather and so on. Just the idea that she'll be able to just leave for a week and forget about these questions is liberating for her. The parcels are surrounded by woods and Cathertine will still have these woods to look for mushrooms, something she likes particularly. Knowing that the area will not really change when sh'll stroll through the plateau helped her take this hard decision to sell the vineyard, I guess. Speaking of the vineyards' fruit this year Julien will be the only one to pick and make wine actually, Laurent keeping working temporarily only with the small surface he already has, and the following year in 2016 they'll both pick the grapes between them two, sharing the surface evenly for their own separate domaines. For Laurent this seems a big increase of surface but actually he does already some farming for Noella Morantin so it shouldn't change too much, just that he'll work on his own parcels from now. And Julien has among other experiencers his time at Les Terres Promises in Provence, and he also worked in the Loire the recent years while looking for a place to set up his own domaine. Asked about why some parcels must be uprooted Catherine says that when you manage a vinayard you have always at one time or another a parcel to uproot and some replanting to do, sometimes because too many vines are missing (I guess that if you replant all the missing vines you don't have an old parcel anymore). I know Catherine's reluctance to be on the pictures but I'll risk her wrath with this one, both of them are so well, they don't really look like people doing serious real estate business together. Speaking of this corrugated iron building, the chai, Laurent and Julien will rent it to Catherine, it is very convenient to use because it's just along the vineyards, no transportation worry or risks. See on this story a few pics shot in this building with pressing and devatting, it really looks like it's in the woods, actually it's just at the edge of the cliff, the trees offer a good shade, there's a breeze and on one side it opens on the plateau with the parcels. They'll use also the sidebuilding pictured above to keep the tractors, as Laurent and Didier buy back the tractors and other tools from Clos Roche Blanche. From there they're immediately in the vineyard, very convenient too. The use of the building will not bring unwanted traffic near the house which sits at a safe distance below. I guess they may not need it but Didier will be close in case of need to help with these tools he knows so well if necessary. We shamelessly had a few sips from the vats after Didier showed up. He led us to the deep cellar in the sandstone hill below the chai, the door being jealously guarded by a few hens (pic on left). Speaking of this cellar they'll let Laurent an Julien use it for a couple of years, the time for them to each find some kind of facility, ideally with a cellar, which shouldn't be too difficult in this region as there are plenty of abandonned winemaking caves in this region (they might need a more roomy place though). I remember when some 5 years ago Didier and Catherine organized an outstanding vertical tasting with the wines of the domaine, it took place in this very cellar, which added a layer of thrill to the friendly gathering (see story here). I asked Didier about the prospect of having suddenly lots of free time, he said that he'd keep doing some consulting work like he's been doing already for a while. For example recently he was consulting for Valérie Forgues of Domaine de la Méchinière in Mareuil, the village nearby along the Cher river. Didier also runs on the side a wine laboratory for the usual analysis, he already works for colleaugues needing testing of their juice/wine and his lab will be reachable 24 hours a day (on demand) and on weekends, with a flexibility the local laboratories can't offer. Plus I'd add that as advice often comes with testing, his own will be certainly very wise and tilting for an uninterventionist winemaking. We tasted a few wines from the very last vintage of 2014 including some of their sauvignon. This year the production was pretty small compared to a normal year (but has there been a normal year recently ? ), with the rain and later the drosophilia, this is too bad for a last vintage because of course all the buyers in France and abroad had an even tighter allocation (you already know it probably from your caviste, don't let these bottles pass if you see some). This is at a point that they don't even have a bottle of their own reds to drink for themselves, they resort to drink the bottles that friends and other winegrowers left when visiting, of course they like them too but they were used to having some of their own wine on a regular basis for their daily consumption. Catherine says that now she realizes how much she was attached to CRB wines and she feels a big void suddenly. __ Sauvignon 2014 (from a vat), was supposed to be bottled the following week. Nice roundness and richness. Catherine says that for this last vintage (2014) everything is bottled as Vin de France (table wine). they even keep the domaine name on these lablels but she says the administration shouldn't bother them now. She says (and Didier nods) that they've so much bothered with the AOC hassles that it was a relief for this last year to drop it altogether, it's a discreet way to make a statement. 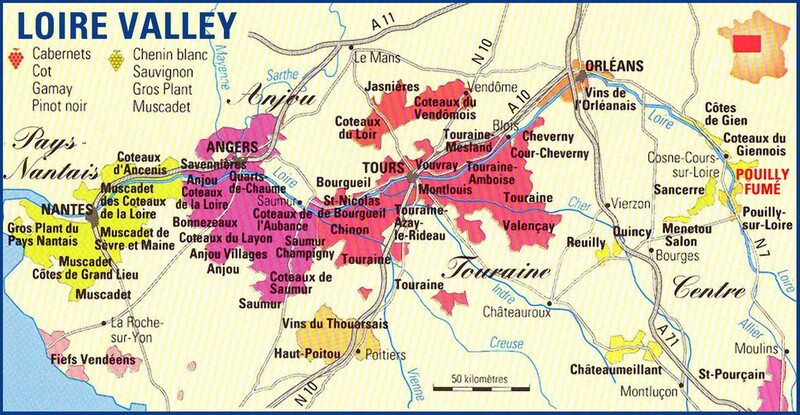 On the other hand they say that's it's sad because they did all they could to promote the region and the Appellation in spite of its shortcomings. Didier says the initial idea was very good but it veered off course at one point, not only because of the administration but in large part because the vignerons didn't do their job and chose to make easy shortcuts. __ Pineau d'Aunis 2014 from a fiberglass vat, a wine between a red and a rosé with golden shades, oeil de perdrix Didier says (partridge eye in English) , very interesting color. Peppery nose, white pepper someone adds with a laugh, to be more specific, but Catherine disagrees, saying that she has some black pepper that smells very similar. Delicious wine, nice fruit, no spit, take everything if it comes your way. Some salty notes too. __ Gamay 2014, from a vat too, will be bottled short time afterwards. I warm my glass in my hands as this cellar is quite cold and only take a sip after. Delicious too, makes only 12 %. Lovely. 15 hectoliters/hectare. __ Pif 2014, blend of Cabernet Franc & Côt, named from Catherine's dog Pif who passed awxay in august 2014. Pif was always around when you'd visit the cellar or stroll in the vineyard, it was there at the harvest and at the pressing and devatting, we're all sad. Very cold wine too because Didier cooled down the wine in the vat to have it settled as he just racked it yesterday. After patiently warming the glass a couple of minutes I risk a sip : delicious thing, a killing. I shot the two pictures above with my phone (Sony Xperia M2) and I'm surprised myself by the result, especially by the rendering of this glass of Pif which is close to what I remember of my experience that day. Even if the light bulb behind adds some transparency you can almost feel visually the life of this wine, I hope they don't filter it when they'll bottle it. There's a pepper side in this wine too, Didier says that all their wine have some peppery notes, not only the Aunis, even the white, because the terroir can bring that too. No needs to say I recommend it too. Asked about how their buyers and importers reacted to the news of their stopping the domaine, Catherine says that she had lots of warmful and sorry responses. Recently last february they had dinner one day with David Lillie of Chambers Street Wines and the Louis Dressner Selections people and this was very moving for them all, shedding a tear like for a painful separation, they have been like friends for decades, in the early years when the domaine was in conversion Joe Dressner and David Lillie would always travel and visit the domain together (starting in 1993/1994). The two men were very different in their own style and still fit very well together. Pinot Gris 1953, from Clos Roche Blanche ! Here is a real rarity because there's no chance you come across this wine in any wine shop or even on auctions : here is a wine that was made in what was not yet known as Clos Roche Blance in 1953. This is a Pinot Gris made by Catherine's grandfather, she remembers that in they called it Malvoisie. Bottles were rare then and when growers would keep wine for themselves they'd often used recycled bottles, like here it seems to have been a bottle of Porto or something like that. After all these years the wine shows of course signs of its age, I find some oxidative notes reminiscing Rancio maybe. Big acidity, Catherine says that it's obvious that the grapes were picked barely ripe, that was the norm back then to pick early. She says that one of the reasons is that in those years growers sold most of their wine in bulk for the négoce and it was blended in Saint-Aignan with wine from Algeria, the Algerian part bringing an opulent maturity and the Touraine component the acidity. They don't know exactly how this pinot gris was vinified, Catherine's gradfather left a few notes taken along his years in the cellar when he made wine (he sold most of the fruit/juice to the négoce) but catherine remembers that pinot gris was his preferred variety, which he called malvoisie, and people at that time like the oxidative edge in the wines. Didier says that this variety yields very small volumes of grapes, typically 2 or 3 clusters per vine, and the grapes had this grey/pink color, they were also very good to eat just like that, Catherine says that they still have 3 or 4 vines of it and they like to have them as table grapes. They have 3 remaining bottles of this. some of my greatest wine pleasures come from CRB--from the wines, the people who drink them, and the people who sell them. Best wishes for a wonderful retirement, for much travel, and perhaps for looking in sometimes on your successors!